Like Andi says in LOVE, UNEXPECTED, someone (they don’t yet know who) named the wooden motor yacht Drifting Dreamer for a reason. For me, the name brings to mind the old song “Moon River,” with “two drifters off to see the world.” As Zeke observed, in 1939 no one built a 50-foot yacht if they didn’t have some big dreams. I loved how everything comes together, making the story’s restoration theme not only about Drifting Dreamer, but Andi’s dreams as well." I Am A Reader - Does Zeke Keep his Promises? 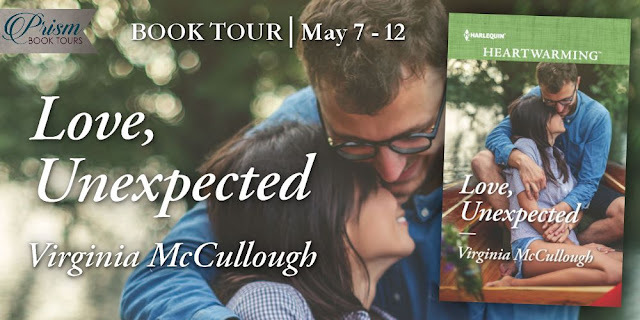 "Love, Unexpected by Virginia McCullough takes us back to two moon bay. I love this little town. I always enjoy each visit. In this visit we get to restore an old yacht as well as get to know the lovely Andi and Zeke. The are both very humbling and sweet. I enjoyed getting to know both of them." Andi stretched her arm to get deep inside a hard-to-reach cubbyhole behind the navigation table to check for damaged wood. Her hand hit a divider with a finger grip, but the first tug didn’t budge it. The second and third tries didn’t move it, either. Determined now, she took a breath and gave it one more hard pull. Bam…she captured the graying piece of wood, but jerked backward with the force of the movement. When she righted herself, she shined her flashlight inside to have a look inside the narrow space. The beam caught the corner of something that looked like paper. “Well, well, what’s this all about?” she said to herself, curious and excited. Secret papers? That could be an overstatement, but these pages weren’t left out in the open. Someone had stashed them out of sight. Zeke laughed. Drifting Dreamer wasn’t exactly ready for even a short cruise. It wouldn’t be long, though. Andi was making progress. I definitely recommend this novel to all fans of contemporary romance. I'm looking forward to reading more by this author." “Oh?” Andi’s heart pounded as she waited for the information. She was impatient for it, whether she’d like what she learned or not. “Yes.” Joy paused, but Andi didn’t fill the silence. "Heartwarming is definitely the right category for this sweet romance. It's such a subtle one, which is a breath of fresh air in a market saturated by fast love and lust. 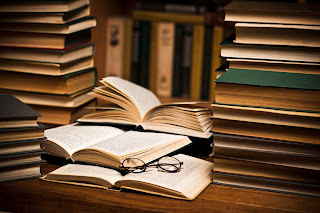 Don't get me wrong, I do enjoy a lot of those books as well. But a story like this one feels so much more realistic to me and leaves me feeling a bit more peaceful and nostalgic. ...I have fallen in love with Two Moon Bay and its inhabitants. I hope more stories are yet to come from this beautiful place." "I thought it was sweet, inspiring and heartwarming. Andi and Zeke had wonderful chemistry and their story were relateable to me. 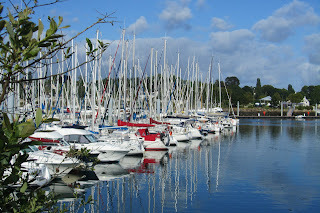 I love the beautiful setting of Two Moon Bay..."
Wishful Endings - What’s So Special about a Wooden Yacht? 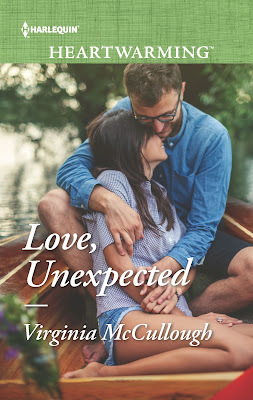 "I haven’t read a sweet romance novel in a while, and this was definitely a nice refreshing one. I read this book almost entirely in one sitting even though the book is almost 400 pages long, and was engaged for every single page." Zeke opened a cabinet where they stored things they almost never used and spotted a couple of vases on the top shelf. He pulled one down and arranged the flowers inside it before adding water. “It’s been a long time. That’s a fact,” Zeke said. This is a relaxing read with a few twists. However, it is mostly predictable but written with a flair and well-utilized literary skills. It keeps the reader's interest." Drifting Dreamer comes into Zeke’s life as a big surprise—and not a welcome one. It shows up unexpectedly at his dock one day. And not in all its glory. With peeling varnish, cracks in the once pristine mahogany cabin, and bronze fittings turned green, nightmares come to mind, but certainly not dreams. It seems Zeke’s dad, Art, inherited this eyesore to settle a twenty-year-old debt. Zeke’s first thought is to dismantle it and sell off the pieces of this boat, which is already dying of neglect. But luckily—for the boat and Zeke—Andi shows up with an idea, and Zeke’s initial impulse suddenly doesn’t seem so appealing anymore. Spinning dreams is at the heart of LOVE, UNEXPECTED. Zeke Donovan has an old dream he was on the way to fulfilling, but his commitment to look after his dad led him to set aside what he wanted for himself. On the other hand, Andi gradually discovers the possibility of having something wonderful she’d never dared to dream she could have. As they find themselves attracted, becoming fast friends who fall in love along the way, they uncover hints about Drifting Dreamer’s first owners, whose story is linked with the coming the Second World War. Charles and Mary Peterson have plenty of dreams and maybe a few conflicts to deal with, too. (Families are good at bringing in a little conflict, aren’t they?) At first these discoveries lead to more questions than answers, but Zeke and Andi aren’t inclined to quit until they piece together almost eight decades of the boat’s life. As Andi and Zeke begin to nurture their individual desires, they’re inspired by Charles and Mary and they understand why Drifting Dreamer is an apt name for the yacht. They also come to identify with Charles and Mary’s dreams—even those unfulfilled—as they begin to fill in the blanks of the couple’s joys and sorrows. And it might be that no one in the boat’s long life ever felt the same way about Drifting Dreamer than her first owners—at least until now. Andi and Zeke soon learn that one summer can bring big life changes. By bringing the boat back to life, they open up to possibilities and dreams that take their lives in new directions. So, just as love was unexpected, so were the dreams. Writing Andi and Zeke’s story, I realized once again that given a choice I’ll always choose to believe in the value of dreams, even knowing they might change their form over time or a few might not ever come true. But some do come to fruition—if we work for them. No wonder so many of us keep on believing in the power of dreams. 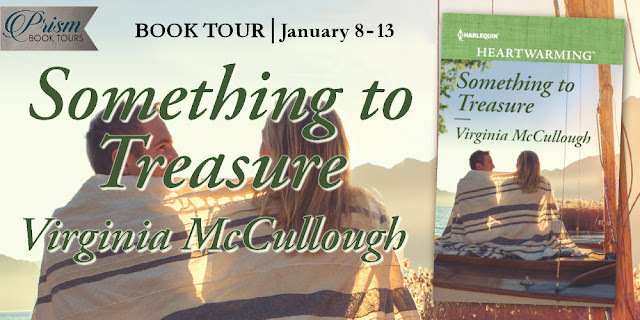 Hello, and welcome to the tour for my new Harlequin Heartwarming release, Something to Treasure, Book 2 of my Two Moon Bay series. . . Dawn and Jerrod’s story is about overcoming the pain of the past, the endurance of family bonds, pursuing work we love, treasuring friendships and community, and believing in possibilities. Most of all, Something to Treasure is a story of hope, healing, and second chances. I hope you enjoy Dawn and Jerrod’s story! 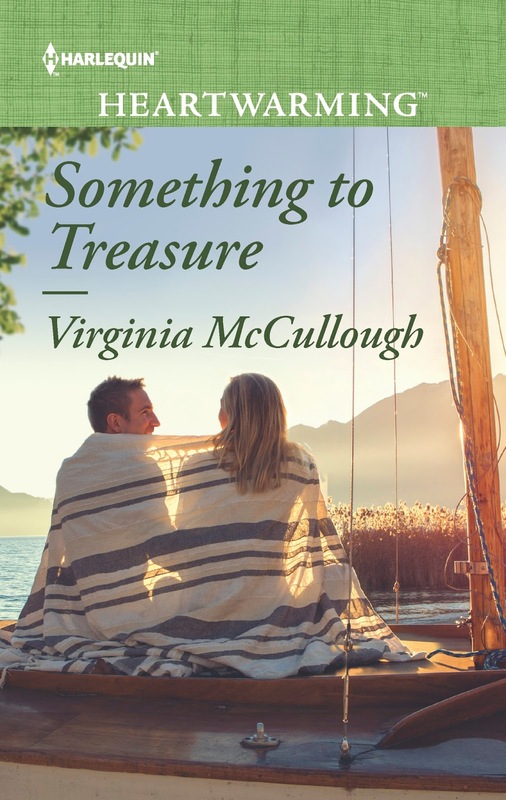 "Something to Treasure by Virginia McCullough is a compelling story of loss and discovery. And I’m not just talking about the discoveries Jerrod makes in his diving excursions. Rather, I mean the discovery of friendship, belonging, and home … as well as renewal. 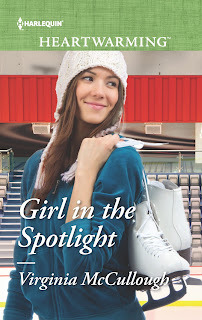 Layered characters and an emotional plot make this a book you can sink your heart into, just like its predecessor Girl in the Spotlight, and I’m already eager for more books set in Two Moon Bay!" Earlier, in the grocery store with Carrie, he’d had a few shaky moments while he let her help him pile food into the cart. Hard and soft shells, refried beans, guacamole, and seasoning plus all the fresh ingredients needed for a perfect taco. He added soft drinks and ice cream, just because. Carrie was happy having a new adventure, but he had to honestly ask himself what he thought he was doing. A dinner between friends? Helping Dawn out after a bad day? Getting to know this newest member of his team? Maybe all of that was true, but was that as far as it went. It had to be. 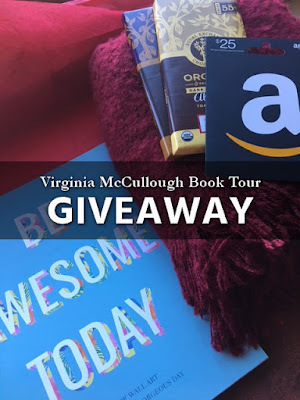 "Virginia McCullough does a wonderful job at describing the emotions of the characters. 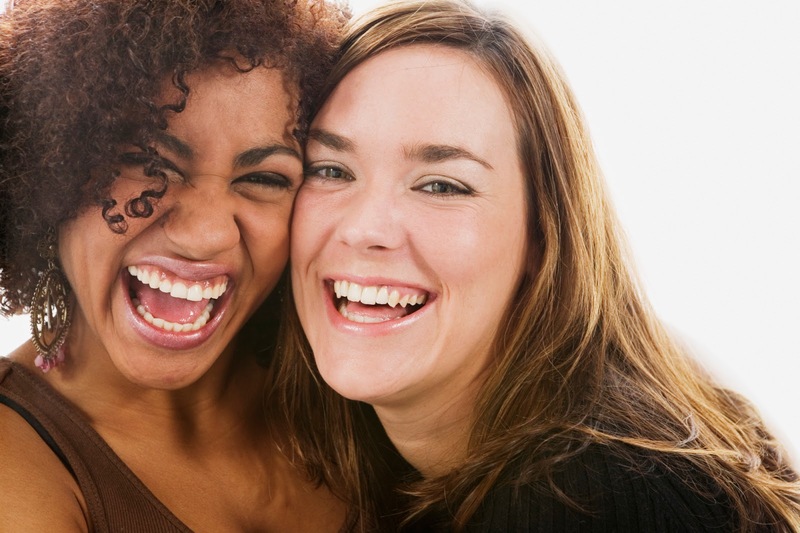 She makes them very believable and personable. It was easy to get to know them and like them. I enjoyed that she doesn't rush her story, she moves it along at a great pace. This made it easier to connect with the characters and become invested in their story. This is a great story about overcoming and learning to open oneself to possibilities. It's a journey that I am grateful I was able to take part in." The flicker in his warm eyes revealed surprise. Sometimes things aren’t exactly as they seem, at least at first glance. Or, maybe, when it comes to the hero and heroine of Something to Treasure, the two are much more than what they show on the outside. For many years, Jerrod Walters has been leading shipwreck diving excursions all over the world. Dawn Larsen runs a public relations practice—and she’s just won an award for one of her PR campaigns. Jerrod sees Dawn’s fingerprints on most everything in Two Moon Bay, from business promotion to charity fundraisers and she even has a hand in the town’s annual sidewalk sale, Stroll & Shop. “Lead the way,” Jerrod said, wondering where she got all her energy. After four appointments, she was as fresh as when they’d started their trip up the peninsula earlier that day. He used to be like that himself, he mused. It came from enjoying his work the same way he could see Dawn enjoyed hers. But her energy also rose from a clear conscience, a lack of burden. That’s how he read Dawn. He’d once thought self-blame was a permanent part of him. Now he wondered if he could let that piece of himself off the hook. He hadn’t even considered it before. Only as he settled into life in Two Moon Bay had he thought it possible. 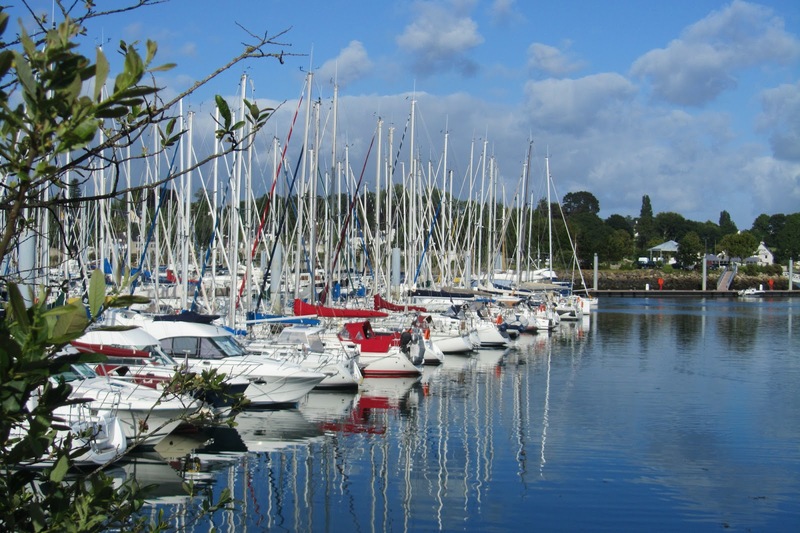 What makes Two Moon Bay such a treasure of a small town? It’s got some great people, for sure, but it’s also filled with colorful places that make life good for the people who live there. I had fun revisiting the town with each book. As I wrote the three stories in the series (Something to Treasure is Book 2), the many characters pointed out new sights and events. "Something to Treasure by Virginia McCullough is something special. This book is heartfelt and inspiring. . . . I loved every minute of watching these two find the way past the attraction to each other. I have to say this was visit to Two Moon Bay that I just adored." One of the best things about writing a romance series is getting to know the characters and exploring their connections, especially their friendships. 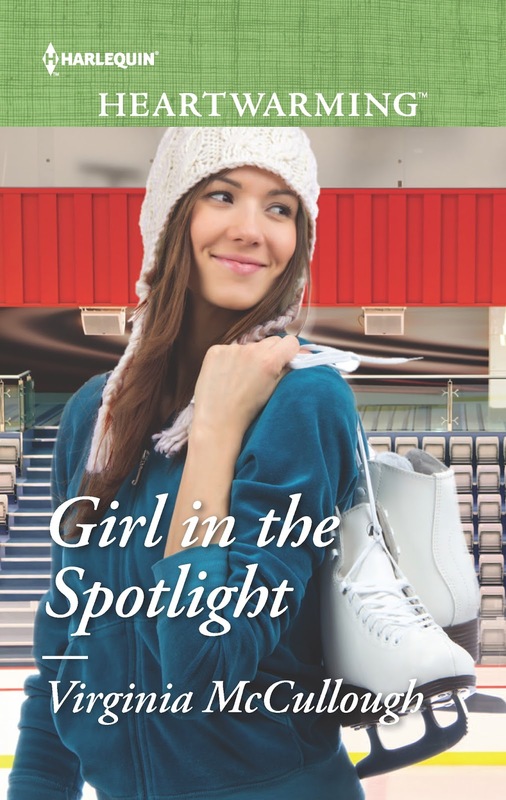 In Girl in the Spotlight, the first book of my Two Moon Bay series, readers become acquainted with Lark McGee’s special friend, Dawn Larsen. As Lark’s confidant, Dawn shares the emotion—and the wonder—of Lark finding the child she’d given up for adoption eighteen years earlier and falling in love with her daughter’s father. Dawn appears early in Girl in the Spotlight and right away I knew that such a great friend needed her own story. And so, Something to Treasure is the story Dawn deserves. "I thought Something to Treasure is a great book. The story is true to life, heartwarming and inspiring. I enjoyed spending my time with Dawn and Jarrod. I love their chemistry and did not want to tell them goodbye at the end. 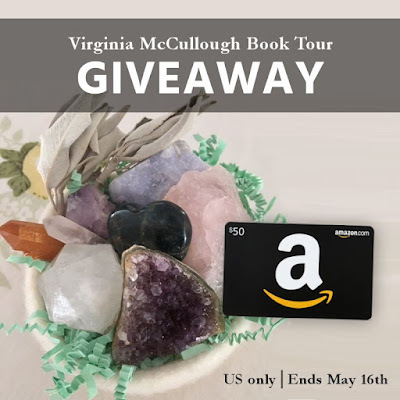 I am so happy to be introduced to Virginia McCullough's work. This definitely will not be the last one I read. I look forward to reading more from her in the future." 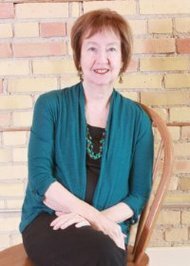 "The author did such a great job in her descriptions of the area that I could picture what it all looked like. And she made the small town of Two Moons come alive in a great way. The story was touching as Jerrod dealt with guilt and grief over the death of his wife and daughter and the way he handled it, and as Dawn dealt with her own grief over what appeared to be the end of her dreams. Yet it wasn’t a mournful story." “Hmm…did she now?” Dawn fidgeted with her necklace at her throat. “So, we should go, little girl,” Jerrod put his hand on Carrie’s back as if to encourage her along. Dawn drew in a breath, her cheeks heating up, probably turning bright pink. "This is a very sweet and touching book. It's always fun to see what treasures people can find in their lives. The characters are well-developed and fun to get to know. It was easy to feel their emotions.